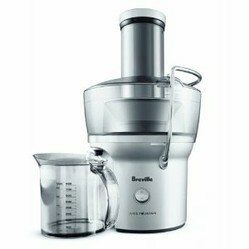 Breville BJE200XL is one of the most popular juicers and for good reasons. Read the detailed review below! Breville BJE200XL is a powerful machine, running at 14,000 RPM, behind the 700 watt motor. Moreover, it has a dual knife system that centers veggies and fruits over the cutter. And bang! This means that you have a juicer that performs much faster than most similar models. You will be able to get a great juice within seconds. Moreover, the effectiveness of juice extraction is great, as the pupl left is almost dry. You will definitely not find similar performance in models within same price range. The size of the juicer is quite compact and the pieces are easy to manipulate. It is therefore no struggle to remove the parts when you need to wash them. Yes, nobody likes the part with washing the juicers. By the way, this piece of equipment is dish-washer safe. However, even if you wash everything by hand, it shouldn't take more that a few minutes to finish. The producer is even suppling a special cleaning brush to ease the whole operation further. There is also a magnets system designed to keep the juicer in place. A lot of nice touches that make the usage experience pleasant. You might wonder if there are also negatives about the product. Although not many people complain, the pulp catch could be bigger. This means that you will need to clean it before being able to make a new juice. And separately, when you use small veggies and fruit, you may get some splatter. And for leafy greens there are better juicers, dedicated to this specifically. So nothing major, especially if you put pros and cons side by side. This is a top pick among juicers. It offers a great value at an economical price. The powerful 700-watt motor allows for speed and quality juice extraction. Convenience has been taken care of well: the machine is compact and easy to operate and wash. It's not very noisy and the overall quality of the equipment is on the very high side. So if you need a quality juicer without breaking the bank, you should really consider Breville BJE200XL. You can find the best price on Amazon - see the link above. If you are interested in a good food processor, you may want to go through the KitchenAid 13-cup Food Processor Review. Yonanas is a frozen dessert maker that touts the ability to create an ice cream like treat that is much healthier than traditional ice cream. Find out if it lives up to its claim. I found the solution for cleaning ceramic glass cooktops of hard to remove cooked on spots and gunk. Read about the solution in this short article with pictures.